It's that spooky time of year again, but instead of focusing on a holiday pet, here's an undead pet that will haunt you long after the Hallow's End decorations have been put away. It's the Restless Shadeling! The Restless Shadeling is a wild pet that's one of only a handful of pets with a unique spawn mechanic. The Restless Shadeling will only begin to spawn each night at Midnight (Pacific Time, +7 GMT) and will continue to slowly re-spawn until 9 AM, at which point they will all disappear back into the shadows. For those outside of the Pacific Time region, a time zone converter tool will come in handy. CRZ might throw off your timing, however, so be sure to check the current realm time once you've arrived in Deadwind Pass. Its Pet Journal entry states that it spawns in Deadwind Pass, which is true for the most part. To find this pet you'll need to seek out the Master's Cellar, an underground portion of the zone. There are two entrances to this cellar, both of which can be found in the ruins just outside of the entrance to Karazhan. Look for the large intact house — in the dilapidated buildings immediately next to it are stairs leading down into the eerie basement. These wild pets only spawn in as primaries. Oddly enough, even though they are level 17-18 they do not come with a team of one or two other pets. Perhaps the Restless Shadeling's ominous disposition scared the others away. That won't stop a pet collector from adding it to their team though! The Shadeling is a solid all-purpose Undead pet. Its main utility is found in its last slot. Phase Shift is a full dodge move, meaning that the Shadeling is great at countering big threats. If your opponent doesn't have a single big burst move to counter, a swap to Death Coil can lend the Shadeling some longevity. This longevity is also bolstered a bit by Plagued Blood, though without some damage over time or multi-hitting moves, this isn’t quite as helpful as it could be. Death and Decay, an ability the Shadeling has in its pocket as well, is a weak DoT that would increase Plagued Blood’s healing, but they share a slot. Most of the Shadeling’s damage moves are centered in its first slot. Shadow Shock is a no-frills Undead nuke. Arcane Blast will scale upward each time you cast it, and the Shadeling’s sole Magic ability. It makes sense, because it’s found in a place so steeped in magic, and yet there aren’t many pets that would benefit from that particular combination of offense and defense. Arcane Blast may end up dealing more damage overall though, due to its scaling nature, especially when combined with the other healing abilities the Restless Shadeling brings to the table. 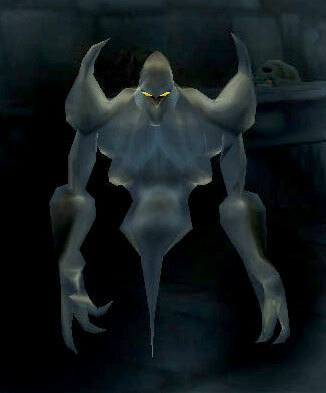 Check out our forum thread discussion on the Restless Shadeling and submit your own thoughts on this pet. Pet of the Month is co-written by Liopleurodon, an experienced pet battler and long-time WoW player. She maintains her own Pet Battle blog and is a Pet Battle columnist on the fansite Blizzard Watch.